(May 23, 2015) – Breakthrough New York enrolls high-achieving, low-income students starting the moment they finish 6th grade, and this summer some of the country’s top college students will be stepping to the head of the class to instruct the enterprising middle schoolers. This season, an unprecedented number – 650 – of college students from across the country applied for the 64 coveted internships as Breakthrough New York Teaching Fellows. The nonprofit organization, which shepherds high-potential, low-income middle schools students to and through four-year colleges, will provide three weeks of intensive training in mid-June, and then the Teaching Fellows will step into classrooms at BTNY’s three sites in Brooklyn, the Bronx and Manhattan for the six-week summer session. Consistently named a Princeton Review Top Ten internship, Breakthrough New York’s Summer Teaching Fellowship program gives college students a chance to help enterprising middle school students refine their skills mastery in math, science, writing and literature. More than half – 36 – of this year’s applicants are African American, Latino or Asian, and 16 are STEM (Science, Technology, Engineering or Mathematics) majors. And, this year, one Teaching Fellow is a former Breakthrough New York student, and four are returning for the second summer. This year’s Teaching Fellows hail from colleges and prestigious academic support programs from across the country, including: Brown University; Barnard College; Berkeley College; Binghamton University; Colgate University; Columbia University; Cornell University; Dartmouth University; George Washington University; Grinnell College; Hamilton College; Harvard University; Macalester College; Morehouse College; Northwestern University; Pace University; Pomona College; Spelman College; Vanderbilt University; Wellesley College; and Yale University; as well as The Corella & Bertram F. Bonner Foundation (known as the Bonner Foundation), Sponsors for Educational Opportunity (SEO), The Posse Foundation, The TEAK Fellowship, and The Gates Millennium Scholars Foundation. 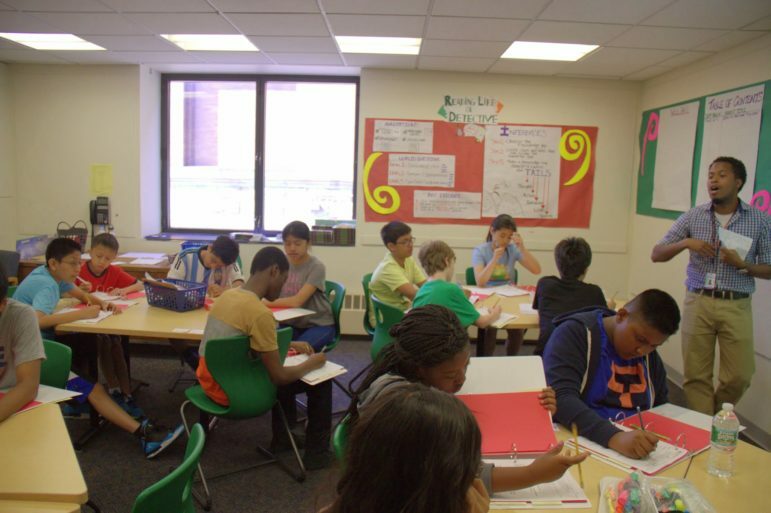 During the summer, each Teaching Fellow teaches one academic class in literature, math, science or writing; teaches one elective class such as basketball, soccer, choir, drama, or karate; and participates in weekly special events with students. Instructional coaches support the Teaching Fellows with content and lesson planning, and feedback, throughout the summer. The Teaching Fellows are selected based on academic accomplishment, leadership experience and ability to learn teaching techniques as demonstrated during the interview process. An impressive 90% of the program’s past summer instructors have gone on to pursue careers in education, with many citing their experience at Breakthrough New York as their inspiration. Breakthrough New York’s three programs operate at The Town School on the Upper East Side, Manhattan, Bishop Loughlin High School in Fort Greene, Brooklyn, and at the Cary Leeds Center for Tennis & Learning in Crotona Park in the Bronx. The organization makes a commitment to assist students through high school graduation, providing everything from tutoring and SAT prep to organized college visits and interview coaching. Upon entry into a four-year college, students become Breakthrough alumni and continue to access resources such as internship and job opportunities. With a staff of over 400 and 25 program sites around the borough, BCS serves 12,000 people every year. Today, BCS is one of the oldest not-for-profit, non-sectarian social service providers in New York City. The event honors philanthropists Charles J. and Irene Hamm, First Lady of the City of New York Chirlane McCray and Forest City Ratner companies.